Mark and Rita had recently purchased an old farm property in the Teme Valley which required extensive renovation work to bring it into the 21st century. One of the first jobs on a long list was to replace a tired and cold conservatory/lean to which had been unsympathetically “bolted” on to the existing building. Having initially explored the possibility of a modern conservatory, Mark and Rita happened upon Castle Ring Oak Frame putting up a frame just down the road and couldn’t help stopping for a look. They must have liked what they saw as within a few weeks they had commissioned an oak framed sunroom with a slated monopitch roof. A local builder was employed to remove the old lean to and to prepare the existing stone dwarf wall in readiness for the oak frame. Naturally nothing was level or plumb being an old building and so a careful site xanax online buy survey was essential prior to drawing up the frame. Two gable trusses would have been sufficient, but a third central truss with wind bracing was decided upon for added interest and to reduce the need for a heavy purlin. Rita and Mark were closely involved in the design process and had the final say in some of the design decisions. 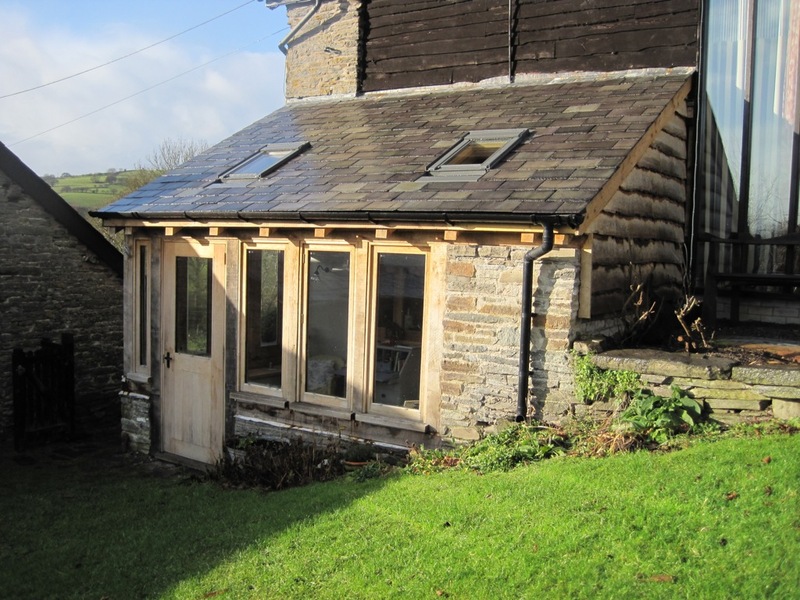 The oak was ordered and within a few weeks work could begin in the workshop. 3 weeks later the frame was delivered ready for raising. An awkward site meant the timbers had to be man-handled from the trailer and up some steps, but a dry day ensured a trouble free raising with the last rafters fitted in fading light! Mark unfortunately missed the raising due to work commitments but Rita was on hand to keep the team going with cups of tea.